It’s Monday. I know. I hear myself joining you in a collective groan. But instead of immediately thinking of all the things I need to accomplish this week, I am going to pause. And breathe. Deeply. Closing my eyes again (not to go back to sleep) and letting my neck slowly drop as I breathe in and remain still. I am determined not to be in a hurry. I don’t want to rush and I don’t want to be late but I also need to fill my emotional reserves with a feeling of inner calm before I tackle a new work week. Mondays are always difficult and I find that being gentle with my mental self is a good way to go before walking out the door to meet whatever the day has in store for me. Just a few minutes of calling up a peaceful image of water within my mind will do it. There is something magical about the wonderful whooshing sounds of water as it meets a sandy beach or glides over a rocky shore. Almost as though feelings of stress are being pulled out of you and replaced with an aura of healing and relaxation. As soon as I hear sounds of water, I instinctively take a few deep breaths and begin to feel my shoulders release tension and drop. The breathing forces me to dump the junk from my head and clear out my thoughts. It’s a helpful exercise that I find works for me and maybe it will offer you some stress relief too. Click here on the words water video to start. 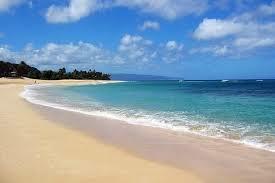 I found on YouTube that features 10 minutes of the waves continually washing upon a serene Hawaiian shore. I find two to three minutes usually works for me. Ten minutes is heavenly as you let the beautiful view of calm water and sky seamlessly meeting each other as far as the eye can see.